All advantages of the original Visi-Model with the addition of removable teeth and gingiva and separate mandible and maxillary. Enables the technician or assistant to learn the dental anatomy more easily and is excellent for lecturing, wet labs and teaching students. Injection molded teeth are extra strong, natural color and are anatomically correct. 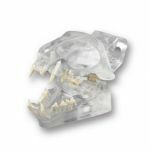 Teeth can be drilled and restored (with acrylic), orthodontic devices, crowns and splints can be applied to the models for demonstration purposes. 4" long. 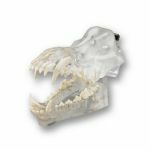 Used by DVM's, instructors, anatomy educators, veterinary students and other animal care professionals. May be used as instructional aids for service organizations, e.g., ASPCA, shelters, community animal organizations, dog training and support groups for public instruction.